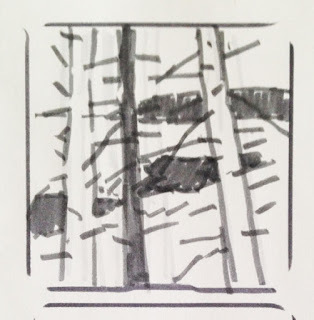 You might think that when you're at a plein air festival and you've only got two and a half days to paint six paintings, that you should just get right to it, and skip doing a thumbnail in your sketchbook. You couldn't be more wrong. The most important thing in this situation is to not make mistakes, because do-overs take a lot of time. I tried to remember this last week at the Castine Festival. Above are two paintings that I very much enjoyed doing, because I love the structure of the subject matter and because I was able to stand in the shade! Coming up with three thumbnails for the first painting only took about 5 minutes or so, and from those three I was able to move the trees around and design a new scene for the second painting the next morning. What a time saver! 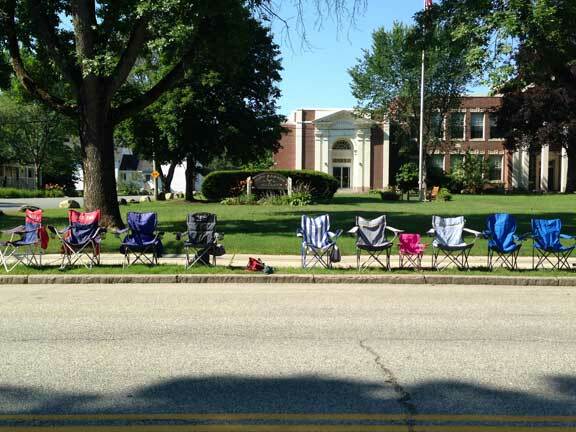 No one will steal your parade chair at the Yarmouth Clam Festival. Even if you put it out on the sidewalk two weeks ahead of time. It's a tradition, everyone stakes their claim and no one messes with the process. Yarmouth has held its Clam Festival annually since 1965. The festival food booths are put on by local non-profit organizations to fund their activities. My favorite is the pancake breakfast at the Congregational Church. 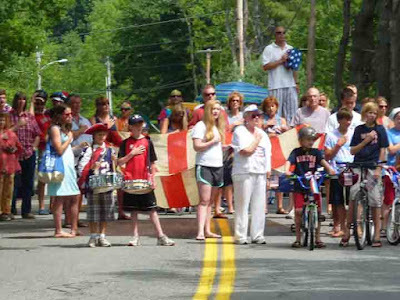 There's an impressive parade, fireworks, live music on three stages, clam shucking contests, a firefighter's muster, fine arts and craft shows, a bike race, and a carnival and midway. People come from miles around every year for the festival. I've been to the festival many times, but the last few years I've missed it. That's because my favorite plein air event of the year is on the same weekend, and it's 85 miles away in Castine, Maine. The clam fest had another successful year in 2017 and so did the Castine Plein Air Festival. I thoroughly enjoyed it! One of the best things about this year's plein air festival was the buyer's stories about what drew them to each painting. 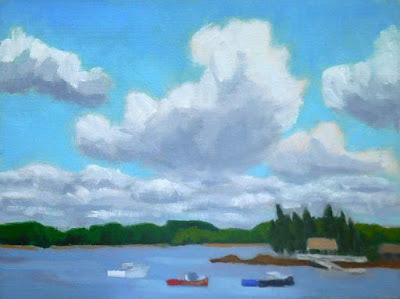 I spent a lot of time painting at one of the boatyards this year, and enjoying the scenery and the welcome shade. 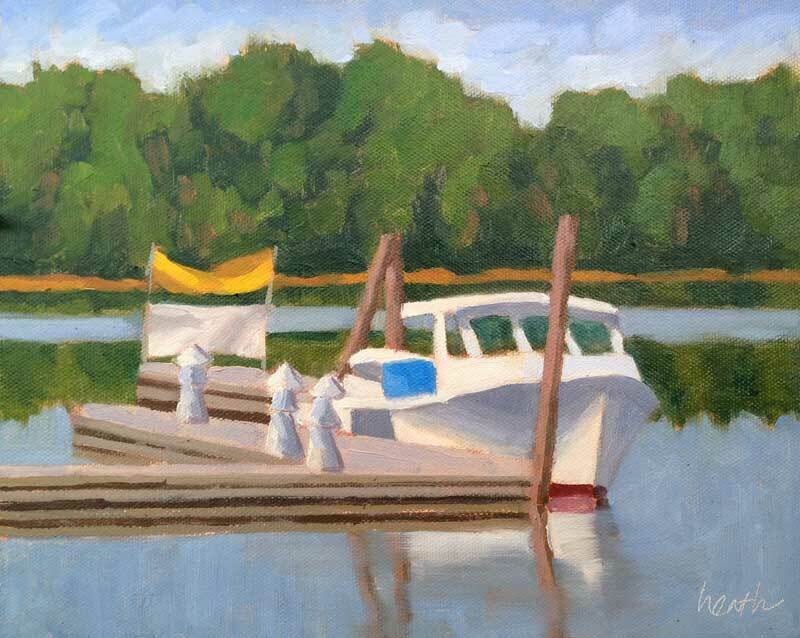 I love painting in boatyards, they are kind of my comfort zone. 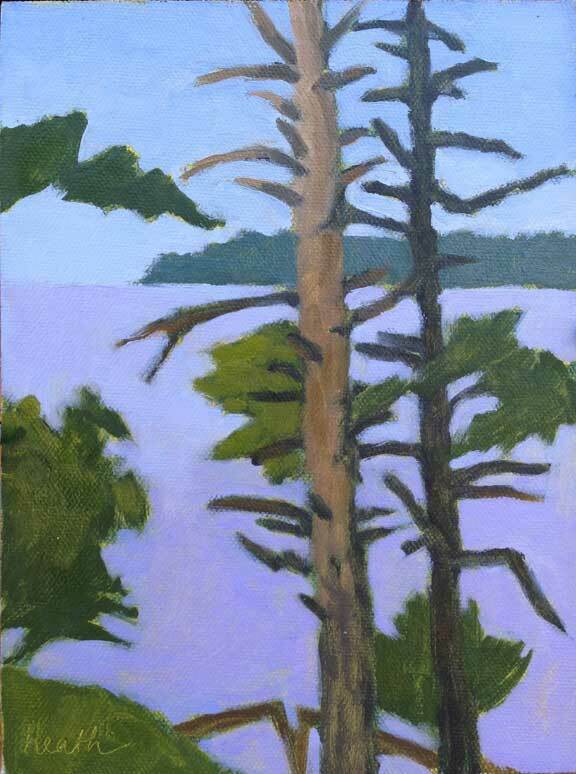 This was my first painting and I almost ditched it part way through. I'm so glad I persevered (thank you for your encouragement, Carol). It went to the boatyard owner's wife, who sent her father on a mission to find it. I painted this one on the first day as well, in a shady spot at Fort Madison, at the entrance to Castine Harbor. 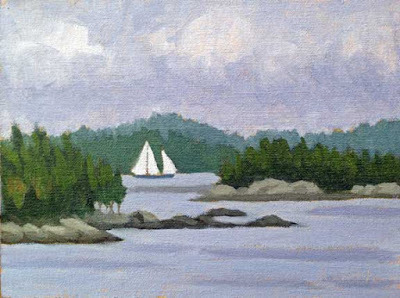 The Guildive, a local ketch, oblidingly glided by in the distance three times, so that I was able to sketch it a few times and put it into the painting. At these festivals you aren't' allowed to use any photos, it all has to be done by eye. The buyers love this view, which they can see from their house. They kept bringing people by my table at the show to see their find. 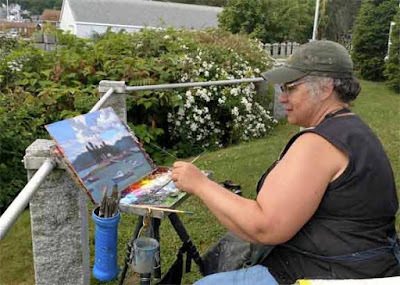 The art lovers of Castine are a very appreciative and lovely group of people. If you'd like to learn more about the Castine Plein Air Festival, here's a post I wrote in 2015 that describes the town and all the fun you can have there. 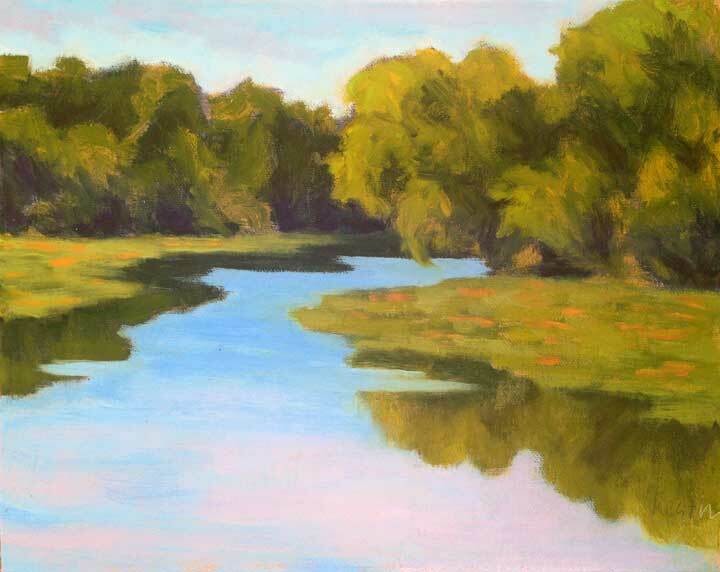 Tomorrow is my last week of co-hosting the Artists Helping Artists Show with Leslie Saeta. It's been such fun and I've learned so much! If you'd like to listen to the shows, they're available as a podcast on iTunes and on Sticher. The shows have been "How to Use Lists to Organize Your Art", "What we can Learn From the Top Rated Artists Blogs", "It's Time to Organize Your Mailing List". And tomorrow's show is about what you can give away to boost your art business. You can join us here live at 9AM. There's a problem with this painting (OK maybe two problems). The first problem came to my notice when I sent a photo off to friend. She thought that there was a meadow in front of the trees on the right. Hmmm, it's supposed to be clumps of small plants floating on the water. Smaller than lily pads, bigger than algae. I asked myself why it doesn't look right. 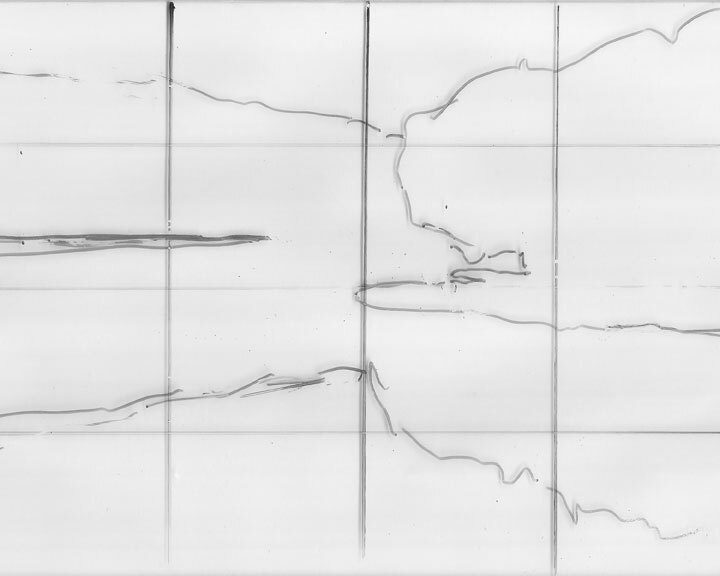 And to aid in the analysis, I went back to the scene, got out my trusty grid on plexiglass, and did a quick outline on top of the grid of what I was seeing. Despite the fact that the reflection is different (it wasn't as windy this morning as when I painted the piece), it's pretty easy to see the problem now. The floating plants on both sides take up too much space vertically. They need to flatten out. I decided that those on the left weren't too bad (even if they don't look like the drawing on the plexiglass) and focused on the right side. Above I wetted the dry painting with solvent and redrew the shape of the clump of plants in ultramarine blue. And then I repainted the reflection on the right and added a few floating clumps in front to enforce the idea. I hope it looks more like floating plants to you now. 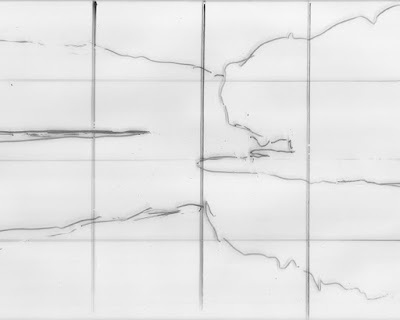 The plexiglass grid is an excellent tool to tell you when your drawing has gone wrong. And one of the most common ways drawings go wrong in landscape painting is when we are attempting to show a horizontal surface receding into the distance. Marsh paintings are particularly problematic. When this goes badly wrong, we appear to be hovering over the scene rather than looking into it. You can make a plexiglass grid very easily. You'll need a piece of plexiglass from the hardware store. At my store they were happy to cut it for me. You'll also need a Sharpie permanent marker pen to make the lines and a ruler. You'll want a dry erase pen for drawing your scene, so that you can erase it. I made a bunch of these for my students in my recent drawing class and they've been put to good use. To use the grid, you first need to check the aspect ratio. 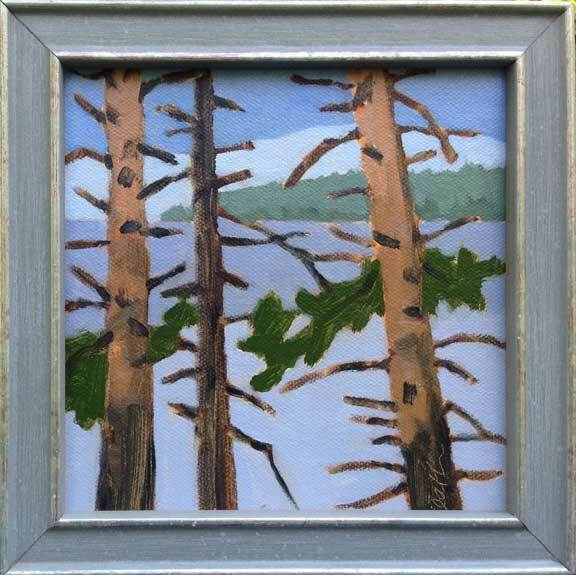 My plexiglass grids are 6"x8", so for this 8"x10" painting, I marked off a quarter of an inch on each side, making the grid 6"x7.5" (an 8x10 aspect ratio). Hold the grid in front of you until the view is enclosed by the grid. Holding steady, quickly sketch the shapes. Now move the grid back and forth in front of your painting until the painting fills the grid. Now you can see where your drawing has gone awry. And actually, you don't need the grid if all you're trying to do is see whether your drawing has any issues. The plexiglass itself with the dry erase marker will do the trick. But the grid can be helpful in laying out your drawing, and in seeing whether your horizon is straight and whether the sides of buildings are vertical. And of course, it's better to do this at the drawing stage instead of painting over a problem. 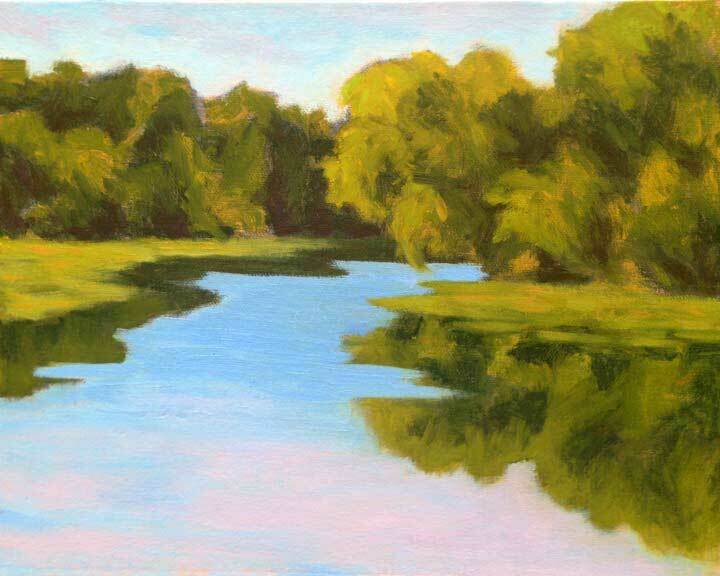 The second problem is the slash of sky reflection in the water, it's a bit crooked. I think I fixed it well enough. Doing a demo is a great experience for an artist. It's a bit intimidating the first time, but once you realize that people are really interested in the process, not looking for a masterpiece, and will ask interesting questions, it's a lot of fun. I've set myself a goal of doing four demos this year, in addition to the small ones I do while teaching. Last week was my second, so things are on schedule. 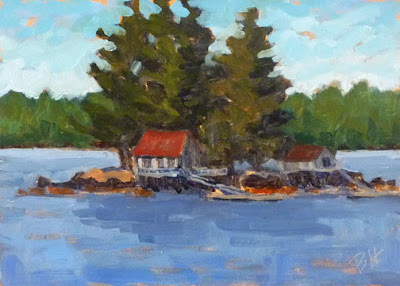 Carol L. Douglas, Ed Buonvecchio, and I were among the artists demo-ing at Boothbay Harbor's Windjammer Days last week. We were fortunate to be able to set up across the harbor from the main part of town, where we had a sensational view of not only the passing windjammers, but the moored lobster boats and Harbor Island. We were in Fisherman's Memorial Park, in front of the Our Lady Queen of Peace church, which dominates the skyline of that side of the harbor. We had lots of visitors, and lots of explaining to do. 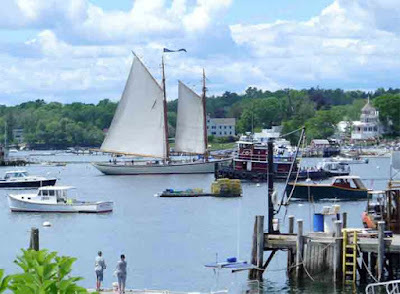 I particularly enjoyed Carol and a young man who helped her identify each of the windjammers. Not that she needs much help, she's a regular at the boatyard where several of them live. I was busy mentoring his older sister, who wants to be an artist. It is so much fun to take our work out to where people can see it happening, and help them understand the process. I love painting in this particular spot. The island is what the word picturesque was meant to describe. I've painted it before and will likely again. 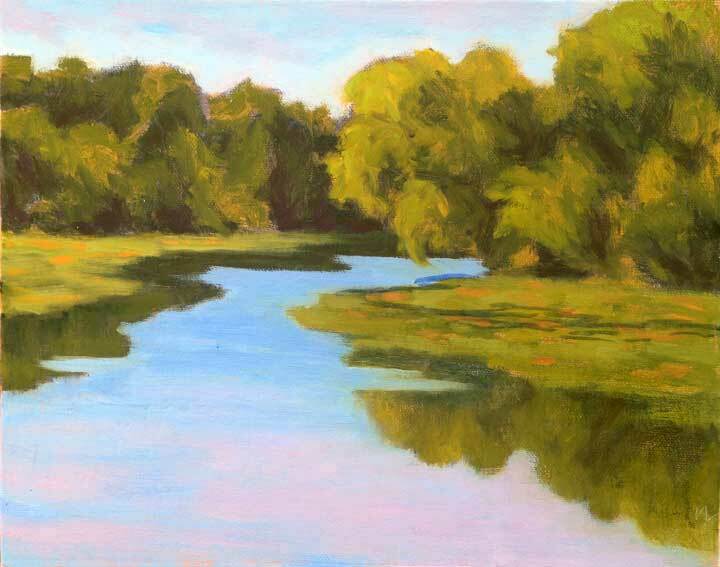 And before I go, I'm excited to tell you that I'll be co-hosting the Artists Helping Artists blogtalk radio show this month with Leslie Saeta. It's such an honor to do this, and I'm thrilled. I have learned so much from this show over the years. Though the focus is on art marketing, there have been many shows interviewing artists and people who artists depend on. 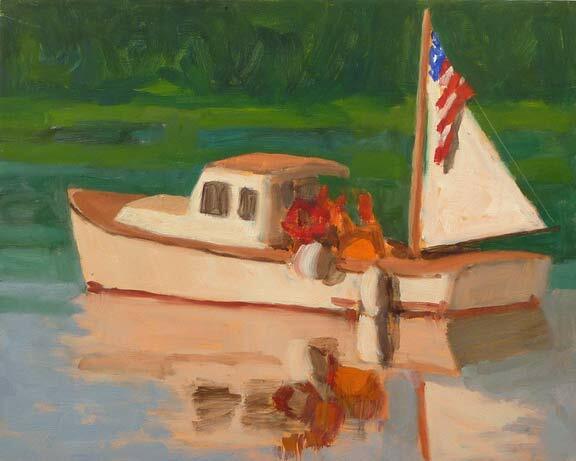 One of my favorites was the interview with Robert Gamblin of the Gamblin paint company. If you aren't familiar with this show, do check it out. The archives are a real treasure trove for artists. You can listen to the show live, or to past shows which are all archived, at the link below. And you can also listen to the AHA show, as it's called, as a podcast. 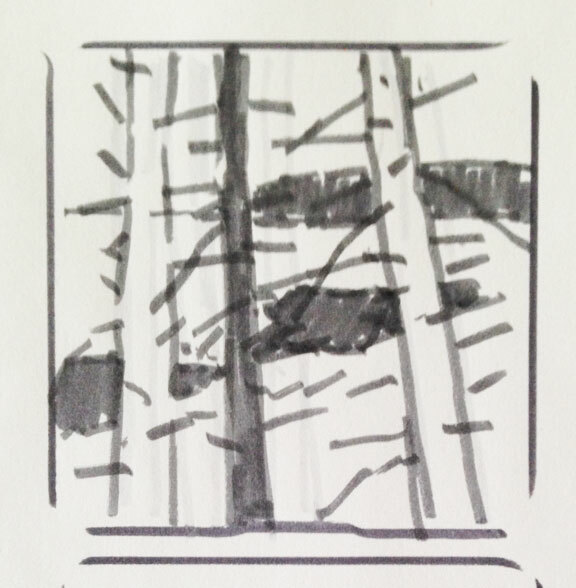 This week's show is "How to Use Lists to Organize Your Art" at 11AM tomorrow. The fourth of July is a big holiday in our neighborhood in Maine. One of our neighbors started a tradition years ago - a parade followed by a cookout. It's a blast. 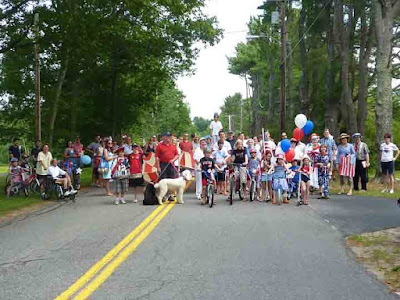 The kids decorate their bikes for the parade, everyone gets involved, and a nice loop is made around the neighborhood. 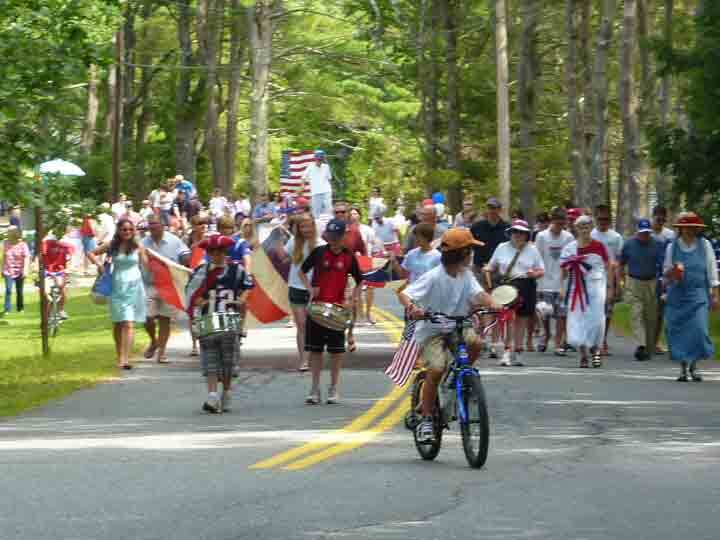 There's even a beautiful old flag carried by its edges, a man on stilts, drummers, and a lady liberty. I feel so privileged to live in a place where everyone gets along and can celebrate together. This year, I take up the mantle of Lady Liberty from my friend Diana who just had her 85th birthday. I hope I can carry it off as well as she did.